Shiraz E-Medical Journal - Comparison of the Stereological Study Findings of Liver Biopsy Between Biliary Atresia and Neonatal Hepatitis: Is It Helpful in Differentiating Them? Comparison of the Stereological Study Findings of Liver Biopsy Between Biliary Atresia and Neonatal Hepatitis: Is It Helpful in Differentiating Them? To Cite: Khosravi A, Anbardar M H, Forootan H R, Imanieh M H, Noorafshan A, et al. Comparison of the Stereological Study Findings of Liver Biopsy Between Biliary Atresia and Neonatal Hepatitis: Is It Helpful in Differentiating Them?, Shiraz E-Med J. 2014 ; 15(1):e19731. doi: 10.17795/semj19731. Background: The two most common causes of neonatal cholestasis are biliary atresia (BA) and neonatal hepatitis (NH). Differentiating between them needs meticulous investigations. Objectives: We aimed to evaluate the different stereological findings of liver biopsies in BA and NH to find features that might be helpful in differentiating them from each other. Patients and Methods: Five patients with BA and four patients with NH were recruited. The study was restricted to infants with confirmed diagnosis through lab data, histopathological findings in liver biopsies, and by intraoperative cholangiography. The liver biopsies were evaluated with stereological study for the followings: volume density of connective tissue, fibrosis, hepatocytes, bile duct, and sinusoid; the diameter of duct, epithelium, and lumen; the length density of duct; numerical density cell; and the mean volume of hepatocyte and nucleus. Results: The stereological study findings revealed that the mean volume density of the connective tissue and fibrosis in NH was about 17.5% less than BA group. However, the other parameters did not show any significant difference between them. Conclusions: Our results showed that portal fibrosis was a significant stereological study finding in BA that could differentiate it from NH. This study is the first stereological analysis of the patients with neonatal cholestasis. Further studies in this field are required to confirm our findings. Neonatal jaundice is usually physiological or due to breast milk jaundice in 10% to 15% of cases. Cholestatic jaundice is relatively less common but potentially dangerous and is often misdiagnosed as physiological or breast milk jaundice (1). Data from other studies indicate that the prevalence of neonatal cholestasis is around one in 2500 live births in the western world (2).In India, 30% of all hepatobiliary disorders are considered to be neonatal cholestasis (3). The two most common causes of neonatal cholestasis are biliary atresia (BA) and neonatal hepatitis (NH). BA is the final result of a destructive idiopathic and inflammatory process affecting both the intrahepatic and extrahepatic ducts, resulting in biliary cirrhosis (4). Its incidence is around one in 8000 to one in 15000 live births and in developing countries, it is considered as 25.8% to 34% of all cases of neonatal cholestasis (5). Early and accurate differentiatiing between BA and NH is very important, because early intervention in the form of Kasai portoenterostomy in BA improves the biliary drainage and prognosis (6). In 70% of cases, differentiating between BA and NH needs meticulous work-up and the experience in diagnosing these conditions (7, 8). Although refined laboratory investigations for differential diagnosis of neonatal conjugated hyperbilirubinemia continue to become larger in number, none of them provides the absolute diagnosis (9). Although Operative cholangiography is the gold standard of differentiating between BA and NH (10), it has many disadvantages including invasive nature, potential surgical hazards, requiring hospitalization, operator expertise, and consequent expenses (11). Noting these disadvantages, finding a simpler and more convenient diagnostic tool is needed. Many tests have been used for diagnosis before operation. Hepatobiliary radioisotope (iminodiacetic acid) scanning is the most commonly used test for this goal. However, hepatobiliary iminodiacetic acid scan is time consuming since priming the patient with ursodeoxycholic acid or phenobarbitone is needed. Moreover, only excretion of the radioisotope in the duodenum rules out BA. Therefore, no radioisotope excretion neither confirms nor rules out the diagnosis of BA (12, 13). Serum gamma-glutamyl transpeptidase (γ-GTP) levels are raised in numerous hepatic and extrahepatic conditions including neonatal cholestasis (14). In isolation, this laboratory test consistently had high sensitivity for BA, but the specificity was as low as 33% depending on the cut-off level taken (15). Thus, independently, this test has no clear advantage in overcoming the problem of false positive results (11). Ultrasonography is also reported to be useful in differentiating BA from NH. While ultrasonography is sensitive in detecting a choleduchal cyst, it is highly operator dependent. Visualization of normal gallbladder while fasting, which contracts normally on feeding, virtually rules out BA. However, the reverse is not always true and in NH, gallbladder may or may not be visualized and may or may not contract on feeding (16). Magnetic resonance cholangiography may also provide information that is useful in the evaluation of the patency of the intrahepatic and extrahepatic biliary ducts but it has many limitations such as the spatial resolution due to small body size and the motion artifacts (17). The value of liver biopsy in the diagnosis of BA has been under discussion. There is some disagreement among different authors concerning histopathological findings that could discriminate intrahepatic from extrahepatic causes of neonatal cholestasis (12). Some studies have emphasized upon the usefulness of liver histopathological features (18), while others have pointed out the lack of reliability of the histopathological diagnosis based on liver biopsy specimens (19). Morphological alterations in BA are closely similar to and often indistinguishable from those of NH. Thus, the greatest challenge in the histopathological diagnosis of diseases causing neonatal cholestasis is the differentiating between BA and NH (20). There is no single test that can definitely differentiate these two entities, but some of the articles emphasized that liver histopathological examination is the most reliable single test for the differential diagnosis (21) or emphasized upon the usefulness of liver histopathological features (22). A study showed that quantitative analysis of proliferating ductuli and proliferation activity of ductal epithelial cells might be helpful in differentiating between NH and BA (23). Stereological studies are now very frequent in literature, particularly in the development/evolution, kidney pathology, and neurosciences areas. Stereological methods are practical tools based on sound mathematical and statistical principles. Stereology provides practical techniques for extracting quantitative information about a three-dimensional material from measurements made on two-dimensional planar sections of the tissues; it may be useful in determining the function of liver and differentiating some liver diseases such as BA and NH from each other (24-26). Considering aforementioned points, it is not an easy task to differentiate BA from NH and more studies concerning searching and evaluating of different tests and diagnostic approaches should be conducted. In this study, we aimed to evaluate the different findings in stereological study of these two diseases that could be helpful in differentiating one from another. A retrospective study of patients treated for BA was performed in Shiraz University of Medical Science. Five patients with BA and four patients with NH were recruited by sequential convenient method. The study was restricted to the infants whose diagnosis of BA or NH was confirmed by lab data, pathologic findings of liver biopsies, and intraoperative cholangiography. In addition, the patients with BA had to be treated with a hepatoportoenterostomy (Kasai) operation. Routinely, liver biopsy was taken from each patient at the time of presentation for making the diagnosis. They were taken from the right lobe of the liver. Paraffin-embedded, formalin-fixed liver sections were cut and examined stereometricaly for histology with hematoxylin and eosin (H & E) as well as trichrome staining. 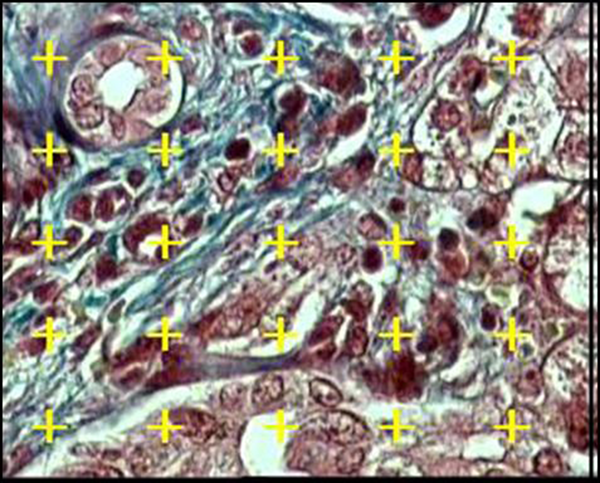 The stereological parameters include: (1) volume density (Vv) of the fibrosis and connective tissue, normal, giant, feathery, and degenerative hepatocytes as well as bile ducts and sinusoids; (2) the diameter of duct, epithelium of duct, and lumen of duct; (3) the length density (Lv) of bile ducts; (4) numerical density (Nv) of hepatocytes; and (5) the mean volume of hepatocyte and its nucleus. Isotropic uniform random sections (27, 28) are necessary for some of the stereological estimation including Lv of the ducts and hepatocytes volume or its nuclei. In the present study, the liver needle biopsy was done from right lobe of liver randomly by gastroenterologist. The tissue was sectioned (5 µm thickness) and stained with H & E and trichrome Masson. A light microscope (Nikin E-200, Japan), equipped with a video camera connected to a computer with flat monitor, was employed. Final magnification of ×1400 was used. Where P (structure) and P (reference) are the number of points falling on the parameters profiles and the liver tissue, respectively (Figure 1). Where "Q" was the total number of the bile duct profiles. If the profile was within the unbiased counting frame and did not touch the left and inferior borders of the frame, it was counted. "ΣP" was the total number of the frame usage and "a/f" was the area of the frame. We studied about 1000 to 1400 frame for each sample and on the selected bile ducts, the diameters of the duct, epithelium, and lumen were estimated using the orthogonal intercept method. Briefly, a probe consisting of three isotropic parallel lines was superimposed on the images and the perpendicular distance between the inner and outer surfaces of the above mentioned parameters was measured by drawing an orthogonal intercept from the outer surface to the intersection point of the isotropic line with the inner surface of the parameters (Figure 2). where "ΣQ" was the number of hepatocytes nuclei coming into focus in the disector height, "ΣA" was the total area of the unbiased counting frame in all microscopic fields (area of each frame was 4900 μm2), and "h" was the height of disector (5 μm). The total number of nuclei was estimated by multiplying the Nv by the total volume of the epithelium. 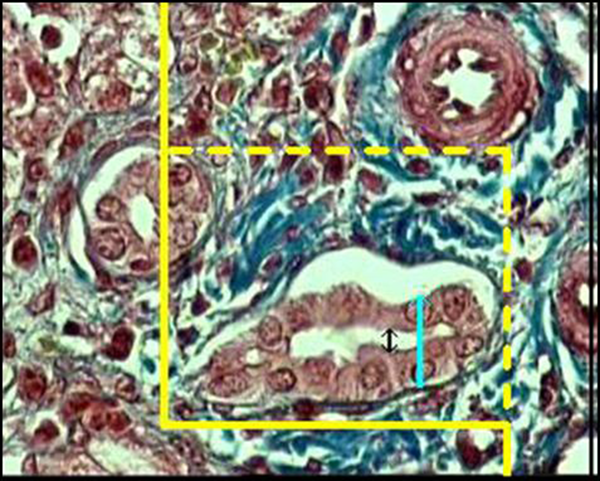 Some cells had more than one nucleus and it was checked on the images to make sure that they were counted as one cell (Figures 3) and (Figure 4). Figure 3. A microscopic section of the liver to estimate the hepatocyte volume, an unbiased counting frame was superimposed on the image (A) any cell that was in focus at the starting 2 μm plane was ignored (B) any cell which came into maximal focus within the next traveling 2 μm optical section was selected. Figure 4. A microscopic section of the liver to estimate the hepatocyte nucleus volume, an unbiased counting frame was superimposed on the image (A) any cell nucleus that was in focus at the starting 2 μm plane was ignored (B) any cell nucleus which came into maximal focus within the next traveling 2 μm optical section was selected. The length of intercepts of the cells and their nuclei (approximately 100 cells), which had been touch by the points of the frame, was measured (Figures 3 and 4). Data were expressed as mean ± standard deviation (SD); the inter-group comparisons were done using ANOVA and Student's t test; P values < 0.05 were taken as statistically significant. The BA group was comprised of three females (60%) and two males (40%); the mean age of the patients was 88.6 ± 32.06 days. In NH group, we had four patients (all were males) with the mean age of 81.25 ± 40.08 days. Analyzing the stereological findings revealed that the mean Vv of the connective tissue and fibrosis of NH group was about 17.5% less than the mean of BA group. However, the mean total Vv of the normal, giant, feathery, and degenerative hepatocytes, bile ducts, and sinusoids did not show any significant difference (Table 1). In addition, the mean diameter of duct, epithelium of duct, and lumen of duct were not significantly different between two groups (Table 2). The mean Lv of duct, Nv of hepatocyte, and the mean volume of hepatocyte and its nucleus did not show any significant difference between BA and NH (Table 2). a Abbreviations: BA, biliary atresia; NH, neonatal hepatitis. d P < 0.05, biliary atresia vs. neonatal hepatitis. c P > 0.05, biliary atresia vs. neonatal hepatitis. bData are presented as mean ± SD. Several disorders should be considered in the differential diagnosis of neonatal cholestasis. Precise clinical, biochemical, and radiological assessments can help to exclude few known causes including infections, certain metabolic diseases, and anatomic anomalies; however, these conditions are not common (3). Therefore, the differential diagnosis usually focuses on BA and NH. Early differentiating between BA and NH is important because management and prognosis vary for each entity (4, 6). In an elegant study, Mieli-Vergani et al. demonstrated that more than 80% of infants with BA had become jaundice-free when the portoenterostomy was done before 60 days of age, while the success rate dropped to 25% to 35% when the surgery was done after 60 days of age (29). Many clinical and biochemical parameters and imaging modalities have been recommended to distinguish extrahepatic BA from NH. Several of these methods had good sensitivity while most of them were hindered by high false-positive rates, especially for extrahepatic BA (13, 21). Liver biopsy histopathology plays a critical role in assessing neonatal cholestasis. Accuracy of percutaneous liver biopsy has been reported in the range of 60% to 95%. Such variability may be due to the fact that there are no strict histopathological criteria to diagnose BA or NH (30). Rastogi et al. (12) reported that ductular proliferation, bile duct and ductular bile plugs, and portal fibrosis as the best indicators of BA; moreover, they indicated multinucleate giant cells transformation as the best indicator in NH. Ductular proliferation is the only significant parameter in multivariate binary logistic model to distinguish BA from other disorders causing neonatal cholestasis, but it may not be significant in early stages of disease (12). Portal fibrosis as an important discriminating feature of BA from NH has been reported earlier (31). Li et al. (32) observed extensive parenchymal giant cells, hydropic and ballooned hepatocytes and extensive lobular pattern are more characteristic features of NH. Zerbini et al. (31) have analyzed liver biopsies in neonatal cholestasis to distinguish obstructive and nonobstructive forms of neonatal cholestasis. They found portal ductular proliferation, bile plugs in portal bile ductules, portal bridges, neutrophils, hepatocyte swelling, and multinucleated giant hepatocytes as most powerful predictors of the cholestasis type. Similar discriminating features in the histopathological studies for distinction between intrahepatic and extrahepatic neonatal cholestatic diseases were reported in a study by Santos et al. (33). This study was conducted to analyze the histopathological parameters of liver biopsies that had the strongest correlation with the diagnosis of BA, helping to distinguish it from NH. We evaluated the histopathological parameters with stereological techniques. These techniques are to understand the structural inner three-dimensional arrangements based on the analysis of the two-dimensional information structure slices only showing. We evaluated the patients with BA and NH by stereological study as a new modality. There was not any similar study and this is the first stereological study to evaluating BA and NH and differentiating between them. We evaluated the liver biopsies of five patients with BA and four patients with NH by stereological techniques. Two groups were compared with each other according to these parameters: volume density of the fibrosis and connective tissue; normal, giant, feathery, and degenerative hepatocytes; bile ducts and sinusoids; the diameter of duct, epithelium of duct, and lumen of duct; the length density of duct; numerical density of cell; and the mean volume of hepatocyte and its nucleus. The analysis of the data revealed that only the mean total volume density of fibrosis and connective tissue in NH was approximately 17.5% less than BA (P < 0.05), but other parameters did not show any significant differences. Our results were confirmatory to the other histopathological studies that showed the portal fibrosis in BA as a significant parameter that could differentiate it from NH; however, in contrast to other studies, the multinucleated giant hepatocytes were not significant in NH group. Moreover, the ductal proliferation was not significant in BA group. This study was the first stereological evaluation of patients with neonatal cholestasis and further stereological studies performed in this field may present a new modality for differentiating the mian causes of neonatal cholestasis. Implication for health policy/practice/research/medical education: Different findings of the stereological study of liver biopsies of biliary atresia and neonatal hepatitis can be helpful in differentiating them from each other. Authors’ Contributions: All authors had participated equally in the study. Financial Disclosure: There was no conflict of interest.